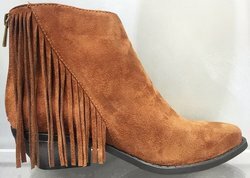 You will find a large selection of fringe boots in tall, short and ankle heights, There boots to wear with all fashion styles. 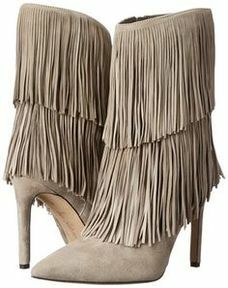 Leather and suede boots with fringe. Boots come in many styles and colors but the one thing in common with all the boots on this page is the fringe. 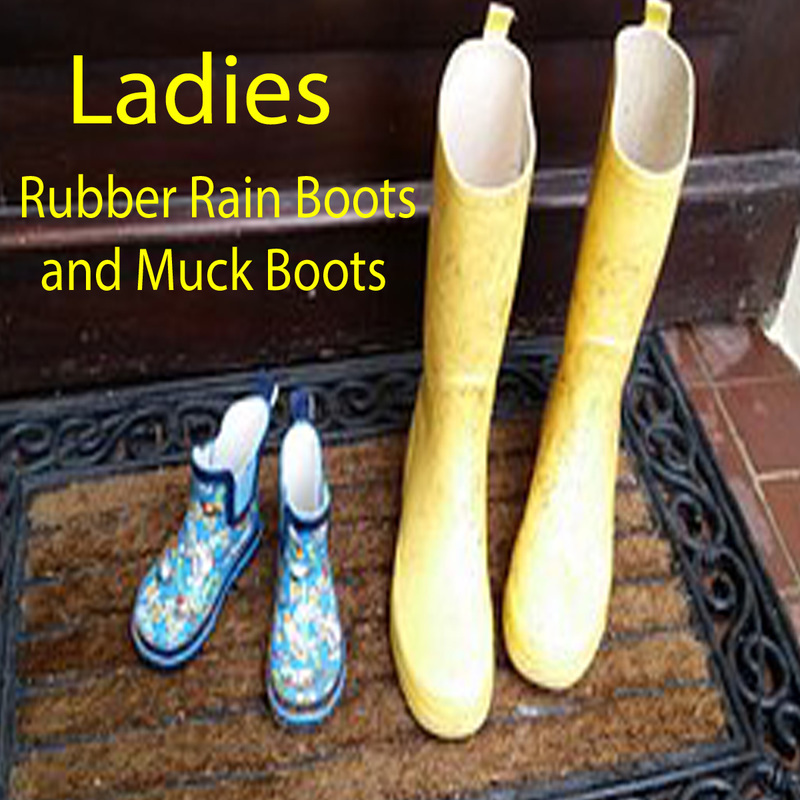 I have sorted out a group of beautiful boots designed to help you easily find what you are looking for. Liberty Black boots are handmade in Mexico for Boot Star by Caborca Boot Co. There are several colors available in tall and short boots. You can step away from the usual with red or turquoise or go with their black tan and chocolate colored boots. The boots are made of leather on the foot and top with a braided scallop overlay, brass grommets and long fringe. Wear these boots with pants or dresses any time of the year. Cowboy boots of all sorts are worn year round. See all of the colors available in tall and short boots. Go totally retro cowgirl in boots paired with a western embroidered dress. Ariat makes a good boot that I wouldn't hesitate in purchasing. It is one of the favorite brands of boots worn by my family. 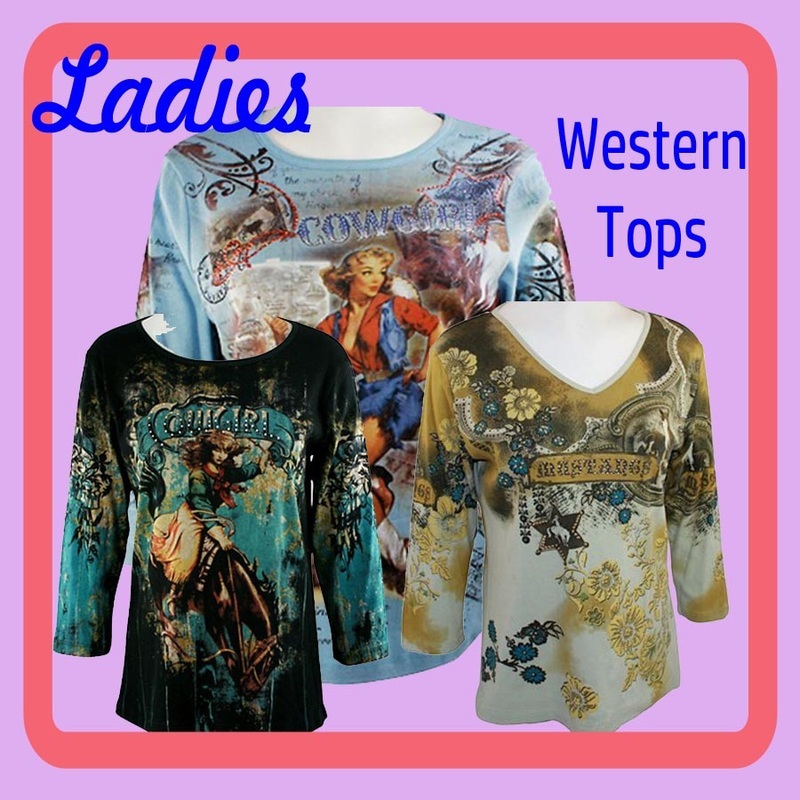 The guys wear them for riding, rodeo, working in the pasture and even for dress wear. The boots are tough and hold up through all the wear and tear. You can read more about the technology that goes into making these a very comfortable boot also. In fringe styles, Ariat offers a leather boot and a suede boot. This boot is leather and has a 9 inch shaft. There is a double layer of fringe that goes completely around the boot. These have a 2 1/2 inch heal and are available in 2 colors. 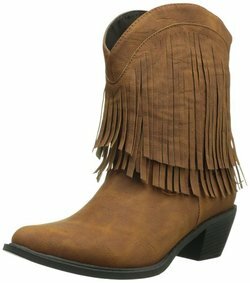 If you like suede, Ariat has these boots with fringe that hangs from the shaft. What looks like stitching on the boot is actually silver tone studs. Tony Lama has a tall fringed boot with a 15 inch leather shaft. It has a snip toe and single stitched leather welt. Roper Brand boots has a couple of options. One is real leather and the other is synthetic. This pair is synthetic leather with a rubber sole. It is about 14 inches tall and the heal. is approximately 2 inches. Roper also has a short boot made of synthetic material. It is about 8 inches tall measured from the arch of the boot. This is the real leather boot with fringe from Roper. This is a nice looking leather boot with fringe down the side. The shaft is about 16 inches tall and the heal is 1 1/2 inches. It is available in 3 different colors. 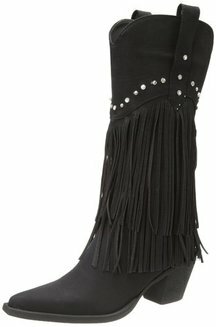 Beautiful boots with fringe come in styles other than cowboy boots. If you prefer high heals, here are some very pretty boots by noted designers that are highly rated by previous customers. Add a little height to your overall look with a 1 inch platform and 4 inch heal featured on this boot. The boots are made of leather with a man-made sole. There are 3 tiers of suede fringe that hang down the 14 1/4 inch boot shaft. These come in red, sand and black. Here are 2 styles from Sam Edelman. Each one comes in 3 different colors and features a pointed toe and high heal. The shaft on this boot is approximately 8 1/2 inches measured from the arch. 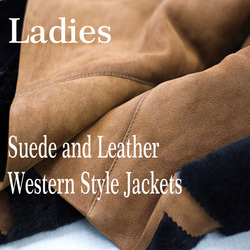 They are made of leather and have a double layer of fringe. The heal is about 3 3/4 high and there is a zipper on the side. ​On the shorter side, these are about 5 inches tall measured from the arch and have a 3 inch heal. 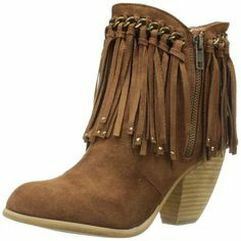 This boots also includes fringe and a zipper. This pointed toe boot is made of leather and has a leather sole. There is a zipper on the side and fringe all the way around. The heal is about 4 inches. A quick note about the boots called Not Rated. This is the brand name and not a customer rating. It is another boot designed for juniors from Naughty Monkey Boots. These boots have the look of suede but are actually fabric with a man made sole. The shaft is about 6 inches and the heal is 3 inches. There is fringe with metallic hardware at the top and there is a zipper on the side. They are available in black, tan and grey. These are leather boots with a synthetic sole. They have many interesting details including fringe near the bottom. These come in 3 colors. I really like this cobalt blue color. The fringe on this boot is only on one side and there is a zipper on the other side. The shaft is about 4 inches with a 3 1/4 inch heal. They also come in black, taupe and rust. 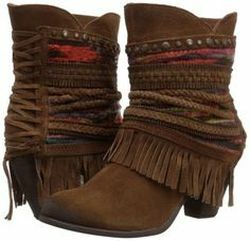 These are faux suede ankle high fringe boots with a zipper in the back. The fringe is on both sides of the boot. ​The heal is approx. 2 inches. ​SODA boots come in several different styles and colors. Below are examples of a few. You can see their full collection for more options. Knee high and over the knee boots are available with high heals, wedge heals and regular boot heals. 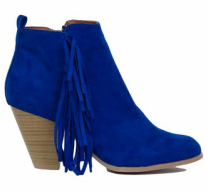 These boots have a 20 inch shaft with tiers of suede fringe and a 4 inch heal. There are also available in black and tan. If you like the stability of a wedge heal. You will like these boots with a 16 inch shaft. The heal is wedged but is 3 inches high. The fringe on this boot is arranged diagonally down the side . This boot is available in 3 colors. This boot come in ​3 colors. 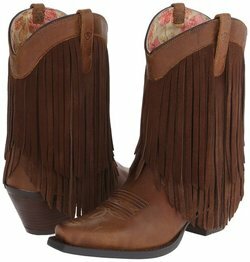 There are just a few more western style boots with fringe that I think are worth showing. 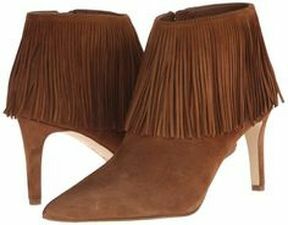 Of course, fringe on any style of boot, in my opinion, is going to add a western flair to what ever you are wearing. 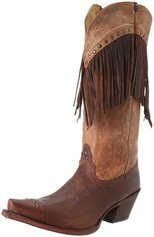 Dingo makes a good looking leather boot that has an 11 inch shaft draped in long fringe. How about a wing tip boot? Corral has this leather boot with a 13 inch shaft. The tip of the toe is accented with silver tone and brass tone studs. These are also leather with a 13 inch shaft. The boot has a snip toe style. 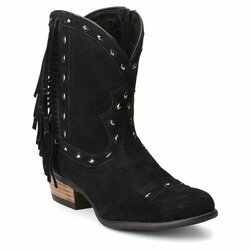 ​These are beautiful hand crafted leather boots with plenty of southwest style. Yes, there is fringe, but are also turquoise and white tribal pattern embroidery designs on the shaft and feet. This is another boot that is highly rated and comes in a couple of different styles and other colors. 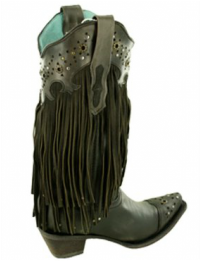 Volatile offers a limited edition black and gold western boot with fringe and Fleur de Lis accents.